031. SIR VIVIAN FUCHS. Issued in the UK by Typhoo Tea Ltd. (1962). 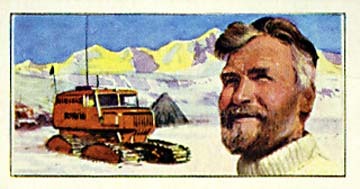 It is card number 2 from a set of 24 cards entitled "Great Achievements." The card was given away as a free premium in packages of "Typhoo" tea. Size: 1.4" x 2.65". Recto: Portrait of Fuchs with sno-cats and mountains in the background.